I visited Euro Disney last year. I found it funny for all the wrong reasons. Irony: it’s sometimes a curse, sometimes a blessing. Each nationality would sit in their Mickyesque ghettos and laugh like drains at the habits of the others. The French Disney interpretation of breakfast was the furthest from full English you could imagine. Our hotel was the cowboy one and felt much like that sinister sci-fi-, Westworld. They played Muzak relentlessly, a foreunner, perhaps to Orwell’s telescreen. It felt for all the world like The Village from that classic sixties programme, The Prisoner. I’m not a number, Walt, I grinned. I’m a free man. So imagine my mirth, then, when Disney laid on Rovers as part of the amusement regime. The Village in the television programme was a place where you went when you stopped spying. Or so it’s implied in the series. And you were kept there with drugs and other mind games and intimidation and numbers and, incredibly, these huge white balls called Rovers. They would chase you. It would be funny if it wasn’t so acutely nightmarish. There was no escape. They would intercept you and swamp you, and bring you back to the village to be a number and not a free man all over again. And there they were at Disney. 10 Euros for 12 minutes. It was all too rich. 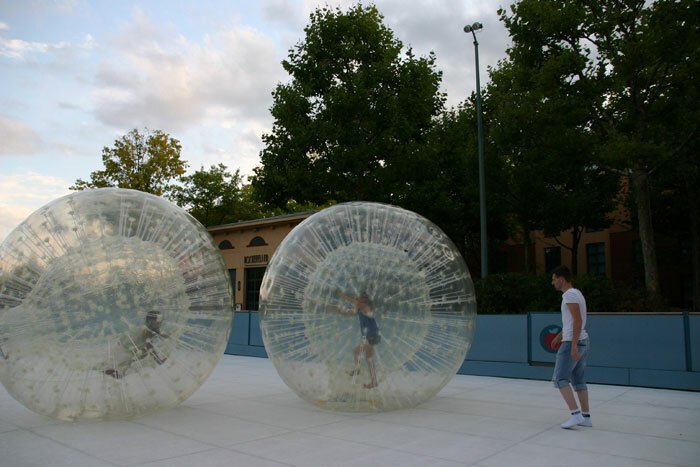 these giant hamsterballs were the recreation of choice for the numbers that thronged Euro Disney. Preposterous. 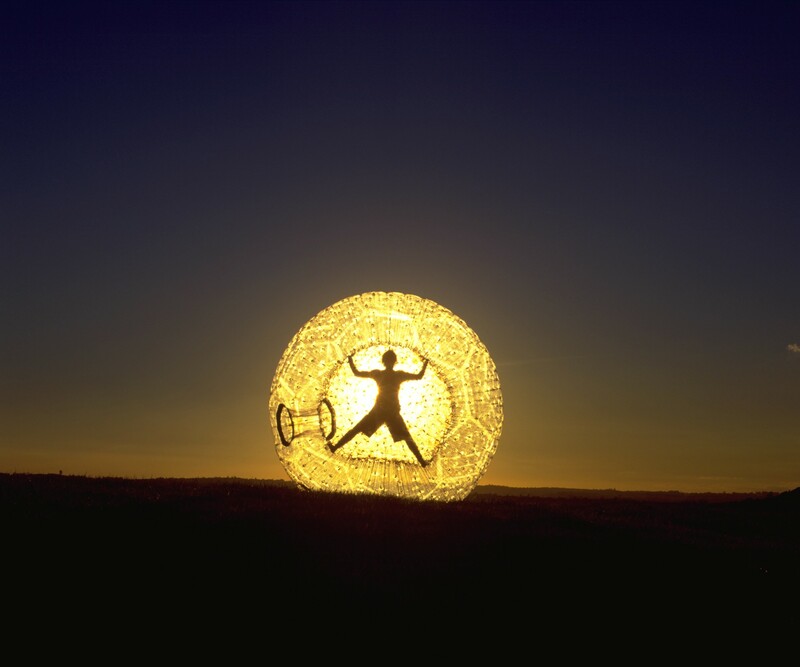 The very idea of walking around in bubbles of our own reality. Although, of course, that is precisely what we do. We view the world through our own glass. With our senses we gather information, but our brain is unique and it interprets the information in its own sweet way. We walk around with a secure idea of how the world is. We are certain, even, sometimes, a little smug about our world and how it is. We hear things and see things and draw conclusions and build on those conclusions without questioning whether our assumptions are rocky: whether the reality we are building is sound. But questioning what’s inside the bubble is what makes you not a number, but a free man. All these years, we have lionised Edwin Hubble. He noticed that things were getting further away with time. and he watched the retreat of heavenly bodies outwards and thought, what would happen if I used mathematics to reverse their path, and followed them back to where they came from? He arrived at the Bg Bang theory. He tracked those bodies back to a fraction of a second before the universe started. Where matter began from nothing. And this has become our reality. This is how the universe began, period. But there’s a nagging question at the bottom of this:agow can something emerge out of absolutely nothing? We built our perceptions on a rocky assumption. Now scientists all over the world question Big Bang theory. In Sandusky, Ohio, Plum Brook Station exists so that NASA could fabricate Nothing. It has eight foot thick solid aluminium walls; it takes two days to pump out the air and another week to freeze out remaining molecules. And then, you have the best approximation to Nothing possible in this day and age. For this Nothing has dimensions. Three of them. And light can travel through it. It isn’t really Nothing at all. We walk around with our perception bubble, and sometimes it never occurs to us to question what we are told. But even the basic ideas we all share can be questioned. That ability: it is what makes us stand out as not numbers, but human beings. 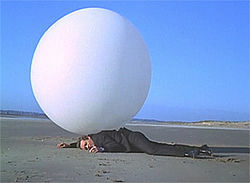 The Prisoner was one of my favorite programs. I was often confused, but as a sixteen-year-old gaga over Patrick McGoohan, I didn’t worry much about fuzzy plot points. Talk about being in a bubble! Hi Blythe. McGoohan was pretty easy on the eye in the series, I quite agree! Thanks for commenting….and have you stopped hyperventilating yet? I do hope so – good luck in your NaNoWriMo quest! We think we are so modern. We have intimate knowledge of how the universe works, and a perception of its size etc etc – all in scientific terms. But it is thousands of years since man started studying the universe – when all he knew was that the sun, moon and stars somehow were a long way off and rotated in complete order. His idea of God started with the premise that whatever was out there was so ordered that it could not have started from chance or nothing. Hence Intelligence and Power were the attributes man gave to the Creator of all this. Perhaps one day man will be forced to admit that a Creator exists! Cheers Dad. Our understanding is endlessly shifting. Been absent for long so lots of pending posts from you… going through them slowly 🙂 Good theme and justifiable post. i have to admit I quite fancy playing in one of those hamster-balls. so now i am confused = is there any reality? I guess we have to believe what our senses tell us and be canny about how our brain interprets it, Sidey. does one have to be direct? Thanks for writing about nothing, Kate 😉 Realising that once WE were nothing emphasises that soon we may be that way again. Better make the most of what we have NOW, and make sure we know where we are going…. I’ve just been listening to Lou Mello’s song suggestion for today, Peggy Lee, Is that all there is, Its posted above. To me, it says it all. I believe that even when NASA creates “Nothing” that “Something” still exists. Nature abhors a vacuum and will fill nothing with something. Intriguing post, Kate. Thanks, Judy. i wonder if ‘Nothing’ has ever really existed? Like one of those huge hamster balls. Maybe it twirls . . . soars . . . and flies with ease. Like the man on the flying trapeze. Moving in a blur from Point A to Point Z. With nothing to break his fall. In USA the great illusion of reality is that just because we can vote we think we have a government of the people. Or is that a delusion ? Another stellar post, Kate, and I loved seeing Clive again in the previous one. Thanks, Penny. Clive is always good for a giggle. Maybe King Lear was right after all? You remembered Westworld! I was fourteen when that movie came out. That one really got under my skin. Then a number of years ago I had a computer I was convinced was spawned from left over parts of Yul Brynner’s Android. I conveniently donated it to a church -God help them and all that shtufff. When your right your right and I think your right. Nothing is something. But I cannot help but think, with all the resources and energy modern man puts into looking into space for answers if the answers he seeks could be right under the very spot he is standing. An insightful take and stance on SidevieW’s theme. ‘Funny for all the wrong reasons’ now that is truly humankind’s reality. Thanks, Hudson, and apologies for taking so long to answer! I love Westworld, and come back to it perennially. You are right: the great miracles are all around us, could we but see them.